Safe Save is the PUP that uses misleading techniques to prevent removal. Use Reimage to locate malicious components and get rid of them faster than with uninstall instructions. A full system scan blocks virus reappearance and prevents traffic to malicious domains. What can I do to stop Safe Save ads from bothering me? How did this adware manage to infiltrate my computer? How can I remove Safe Save adware? As soon as Safe Save virus starts bothering you, you won’t want anything else than to block its activity as soon as possible. This hideous infection is very similar to Browser Shop adware. Speaking of Safe Save, we must point out that it is an adware-type computer infection, which places its files on the system and starts creating various sponsored content, which it immediately displays on victim’s computer screen in the form of pop-ups, banners, and even in-text links. 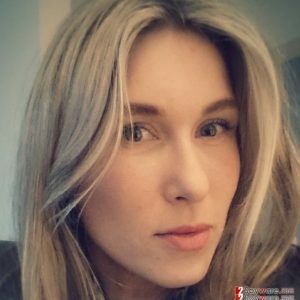 Some computer users might start thinking that Safe Save ads originate from websites they visit, but that is not true. However, the described adware might try to track you and watch what you do on the world wide web in order to find out what content do you like to explore, what kind of information you look for, and which of the ads draw your attention and convince you to click on them. 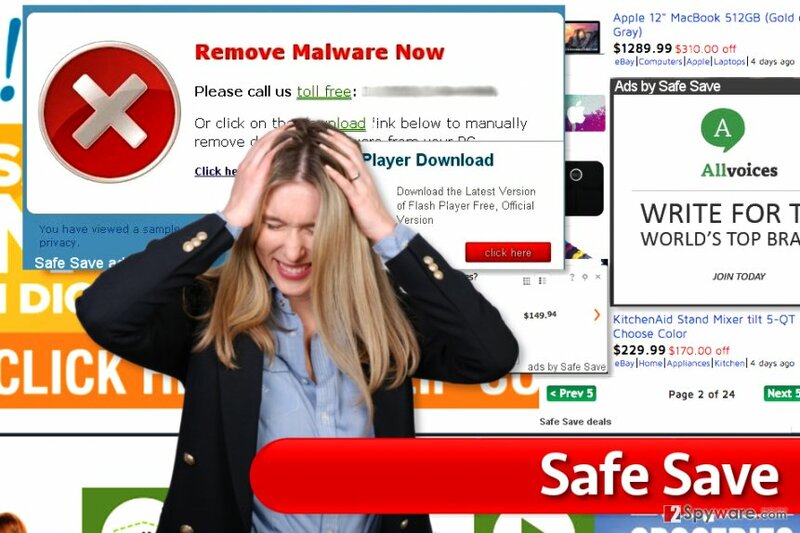 If you noticed bothersome “ads by Safe Save” ads appearing on your screen, we suggest scanning the system with anti-malware programs like Reimage for a quick Safe Save removal because this adware program can provide you risk-posing ads filled with links to shady websites. Safe Save ads are extremely annoying and can provide all kinds of suspicious deals to you. It serves ads in pop-ups, banners, and in-text links, and such activity can cause system slowdowns. If you noticed suspicious pop-ups and banners that pop on your screen as you browse the Internet, or if you noticed that the search engine you usually use provides an increased amount of sponsored search results above the organic ones, better refrain from clicking on them, or you might get redirected to highly suspicious websites. Untrustworthy web pages can try to convince you to install “recommended” software or updates, which are actually completely useless or even malicious. Moreover, if you experience a redirect to a website that asks you to participate in an online survey or a lottery, do not rush to provide your personal details right away. Such suspicious pages might be trying to collect sensitive details about visitors and use this data for unknown purposes. If you accidentally provide your name and email address on such suspicious websites, you might shortly start receiving spam – loads of commercial offers via email. Remember that mail spam is the main ransomware attack vector, so better not provide your email address on suspicious websites! If you would like to avoid such problems, remove Safe Save adware right away. Safe Save hijack occurs with the help of other freeware software that bundles this potentially unwanted program alongside it. Therefore, our main advice is to watch what you install on your computer. Many computer users believe that it is very easy to install computer programs and that all it takes is just a couple of clicks on “Next” and “Finish” buttons in the software installation wizard. Unfortunately, that is not true. If you tend to install software in such manner, your computer will soon be filled with numerous ad-supported applications, browser toolbars that act as hijackers, or even more critical pieces of software. In order to install programs that you need without no additional third-party apps and browser add-ons, always rely on Custom and Advanced software installation options because these will allow you to see bundled additions and refuse to install them. Keep in mind that Basic, Standard or Default setup settings do not provide such opportunity, so try not to pick these settings when installing freeware. The simplest and most efficient way to remove Safe Save virus and block annoying ads it displays is to run a thorough system check with a decent anti-malware scanner. If you do not have such program yet, you can check software reviews provided on our website or just pick one of the recommended ones listed below. In case your are willing to try yourself and initiate manual Safe Save removal, use guidelines prepared by 2-Spyware experts. You can find these below. Please pay attention to the fact that this highly annoying adware tends to hide itself under different names, so try to delete all files and programs that raise even the slightest suspicion to you. Safe Save virus doesn’t want to be removed from the computer system, therefore it tries to hide itself from the user by using modified file names and other tricks. For example, you might not find it in the list of currently installed programs under Safe Save name. It can hide under a suspicious name such as saefe sAVe. Here, look for Safe Save or any other recently installed suspicious programs. Wait until you see Applications folder and look for Safe Save or any other suspicious programs on it. Now right click on every of such entries and select Move to Trash. When in the new window, check Delete personal settings and select Reset again to complete Safe Save removal. Once these steps are finished, Safe Save should be removed from your Microsoft Edge browser. Look for shady extensions such as Safe Save, saefe sAVe and others. Remove them as shown in the pictures below. Here, select Safe Save and other questionable plugins. Click Remove to delete these entries. Now you will see Reset Firefox to its default state message with Reset Firefox button. Click this button for several times and complete Safe Save removal. This hideous ad-supported program tends to hide itself under different names, so we just want to remind you that it is important to remove all Chrome extensions that seem shady to you. One of extensions associated with Safe Save ads is called saefe sAVe. If you can find it in your browser, remove it without any hesitations. Here, select Safe Save and other malicious plugins and select trash icon to delete these entries. Click Reset to confirm this action and complete Safe Save removal. Here, select Extensions and look for Safe Save or other suspicious entries. Click on the Uninstall button to get rid each of them. Now you will see a detailed dialog window filled with reset options. All of those options are usually checked, but you can specify which of them you want to reset. Click the Reset button to complete Safe Save removal process. ^ Danielle Correa. Google Chrome users targeted with 'missing font' malware scam. SC Magazine UK. Product Reviews, Solutions and Articles for the Systems Security Professional. This entry was posted on 2017-03-28 at 01:27 and is filed under Adware, Viruses. You can quickly scan the QR code with your mobile device and have Safe Save ads manual removal instructions right in your pocket. How did you remove Safe Save ads?